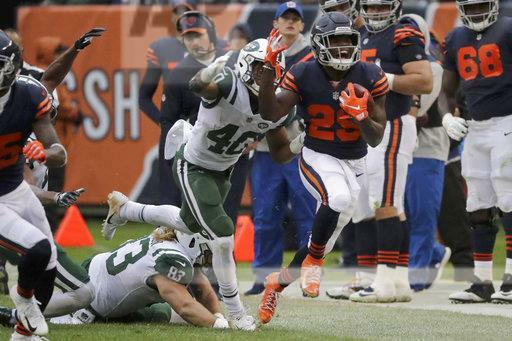 With INJURIES everywhere on the roster, getting a WIN in Chicago over the Bears was going to be TOUGH but the New York Jets were LACKLUSTER and LOST the game 24-10 and FALL to 3-5 on the season. The Jets have THREE straight games against divisional opponents, they NEED to WIN to the NEXT two games before heading in to the BYE to SAVE the Coaching staff’s jobs. The Bears are a FRINGE playoff team and they were PROHIBITIVE favorites going into the game and they CAPITALIZED on BIG plays to come jump out to a 17-3 lead going into the FOURTH quarter. The Jets defense had some IMPACTFUL injuries in the secondary but there was NO rush on Mitchell Trubisky and that was the DIFFERENCE in this game. In the FOURTH quarter, Sam Darnold, who was playing WITHOUT his top THREE receivers(Enunwa, Pryor, and Anderson), TWO running backs either OUT for the season (Powell) or BANGED UP (Crowell), AND the STARTING center (Spencer Long), got the offense going connecting on a touchdown to Chris Herndon to make it a ONE possession game LATE in the game. Herndon has EMERGED as a FAVORITE target for Darnold and maybe he can be the TOP target for the rookie quarterback while the receiving corps gets HEALTHY. The Jets had MOMENTUM on their sideline with that Herndon touchdown but the defense could NOT get the big stop and gave up a touchdown to SEAL the game. I NEVER expected the Jets to win today but would have liked a BETTER effort from them but they BEND OVER and let the Bears ROLL over them. The Jets travel to Miami to take on the Dolphins before coming back to East Rutherford to take on the Buffalo Bills. They have NO hope of making the postseason but they have to WIN the next TWO weeks before going into the BYE week to AVOID turning this season into a DISAPPOINTMENT because after the BYE week, the New England Pats come to town and that is going to be a LONG game for the Jets that can set the franchise back for MANY years.